I'm done bragging. Bragging is harder than it seems. It's tights weather, and I love tights. I especially love Spanx tights with a heavy duty control top. Mac and I are playing our holiday concert on Sunday. It's been a rough go, in terms of stamina, for violin this fall, but it looks like we've both weathered the storm. 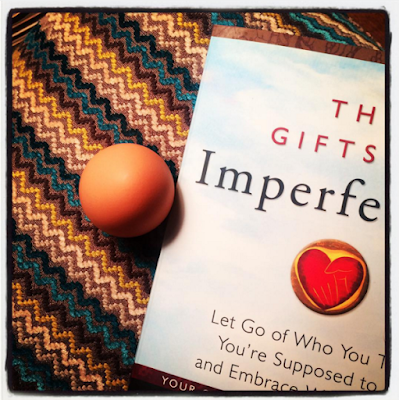 Lee and I have this amazing #TwinTuesday: Brené Brown book + egg. I'm working on living a more creative life this month. I'm engaging in some self-help. I'm also reaching out, growing creative community. What could be wrong with that? It's all so good. I've got a stack of self help next to me here on the table. Feeling anxious today, but happy for the quiet afternoon. I like tights as well. But I wish I had more dresses to wear with the tights.